Marketplace within a node (Pre-alpha). Town center billboard within a marketplace. Concept by Michael Bacon. 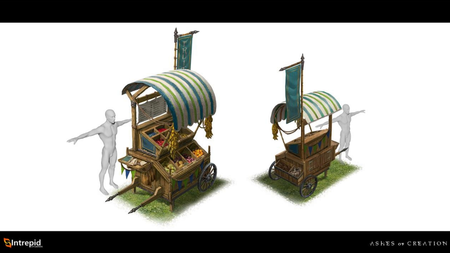 A marketplace is a type of building in Ashes of Creation that unlocks at Stage 3 (village) of an Economic node. A node's government decides the placement of its marketplace. After that, the community must come together to build it. A marketplace UI lists the current items available for sale in the node like a town center billboard. This will potentially list items in other nodes in the same economic region. A player can't purchase directly from the marketplace UI. Instead it gives the location of player stalls where you may purchase the items. Player stalls in a marketplace setting concept art. Player stalls (Kiosks) are located in a marketplace setting within a node. Renting a player stall enables players to sell items as well as provide repair and enchanting services, even when they are not online. Players are not be able to be attacked while occupying their player stall. NPCs manning player stalls may be an "image" of the player. Players are able to input required items for repair and also purchase required materials for that repair. Markets in Ashes of Creation are regional, which means that each market has its own character. 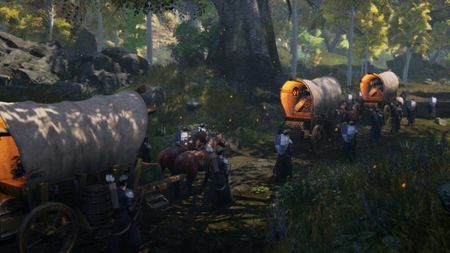 Because resources will shift locations as they’re exhausted, this will keep people moving about the world, seeking out the best resources for their crafting builds, and the best markets for their goods. Item durability (item decay). Zero percent durability will unequip an item, increasing its repair costs. Over-enchanting carries the risk of destroying that item. Players gain craftable items and recipes from deconstructing (salvaging) completed items. An important aspect of a healthy economy is having some item sinks available... There are three kinds of item sinks: You can gain craftable items from deconstructing completed items; You can have decay... and if you want to over-enchant that item there will be a potential to destroy it as well. 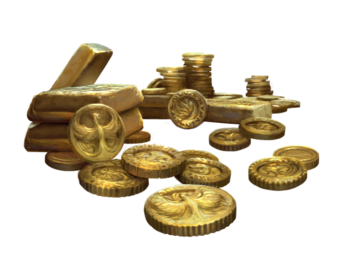 It's important for an economy to experience those types of emphasis on what can be crafted as well as seeing those items that are crafted be destroyed as well..
An escrow system is planned to prevent griefing in the crafting system. We're going to have a UI... you're gonna put the resources in or they're gonna put the resources in. It'll be like an escrow system and then once [the job] is complete you'll get the item they'll get the money. ↑ Video, 30 April 2017 (6:33). ↑ 2.0 2.1 Livestream, 19 May 2017 (33:57). ↑ Livestream, 12 May 2017 (53:08). ↑ Livestream, 5 May 2017 (16:37). ↑ Livestream, 17 August 2018 (16:00). ↑ 7.0 7.1 7.2 Livestream, 5 May 2017 (16:36). ↑ Livestream, 16 October 2017 (59:39). ↑ Livestream, 5 May 2017 (35:16). ↑ Unreal Engine Interview, 23 May 2017. ↑ Video, 30 April 2017 (8:02). ↑ Video, 30 April 2017 (6:54). ↑ Livestream, 5 May 2017 (10:47). ↑ 17.0 17.1 Podcast, 13 May 2017 (25:55). ↑ 19.0 19.1 Livestream, 8 May 2017 (20:41). ↑ 20.0 20.1 20.2 About Ashes of Creation. ↑ 25.0 25.1 Livestream, 5 May 2017 (32:22). ↑ 28.0 28.1 28.2 Livestream, 9 February 2018 (20:40). This page's content was last modified on 16 March 2019, at 23:05.